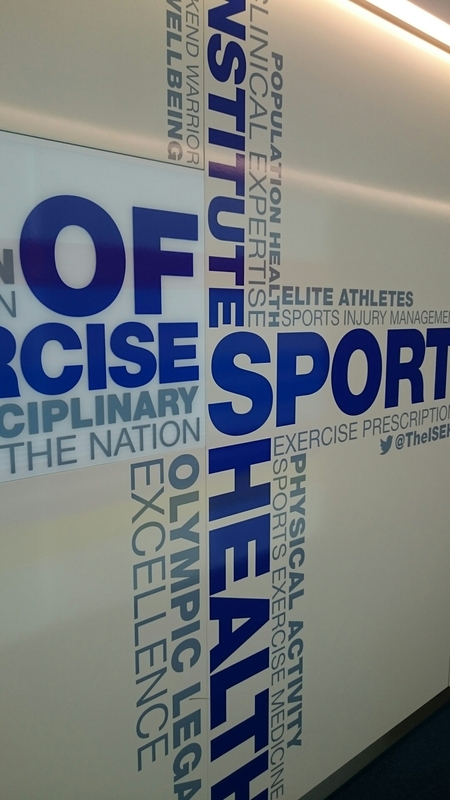 Yesterday I spent the day in a hypoxic chamber at the Institute of Sport Exercise and Health (ISEH) in London. I was participating in a Microcirculatory Simulated Altitude Sea-level Study: a study I stumbled across whilst reading up recent research in the field of altitude medicine. That meant spending 8 hours in a window-fronted room with a dull headache. The day started with a blood sample to do a clotting factor test. Then I had a €27,000 camera placed under my tongue, which zooms in to 160 micrometers to film and take still images of capillary action in my tongue. 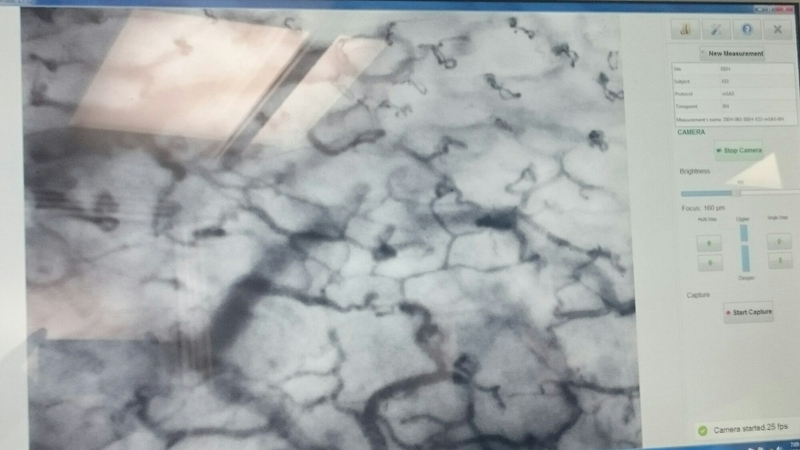 It was impressive science being able to view a single file stream of blood cells squeezing through individual capillaries. Check out my tongue at 160 micrometer focus! In addition to the camera under my tongue, my left forearm had a laser Doppler attached to measure blood movement, as well as another clever gizmo which measured blood oxygenation in my forearm before, during and after an inflatable cuff was used to completely cut off blood flow to my forearm for three minutes. Having the bloodflow completely cut off was like someone heavy sitting on my arm, and when the cuff released, there was this hot sensation as blood rushed back in to my arm. After two minutes, my forearm had became completely deoxygenated and my fingernails took on a blueish grey colour – unpleasant. The researchers assured me that my forearm would have to be starved of oxygen for about 2 hours before permanent damage would occur! After this initial round of tests, another participant and I entered the normobaric hypoxic chamber – normal pressure, reduced oxygen. The oxygen content in the air was reduced to 11-13% if the total volume of air, roughly equivalent to the amount of oxygen present at 4,500 metres above sea level. We stayed in there for 8 hours, being subjected to tests every two hours. The carbon dioxide levels were also monitored to make sure they didn’t go over a safe threshold (5000ppm). The whole time, I had a dull altitude headache – a bit like a hangover or when you’re dehydrated or just can’t get your brain to involve itself in deep-thinking tasks. Despite the amount of funding this setup clearly had, the process for when we needed a loo break was a little bit rudimentary and hilarious (although in my oxygen-deprived state I foudn other things funnier than they should have been). It involved one researcher holding a thick plastic bag with a hole, whilst another one pushed air in using a pump (which wasn’t intended for that purpose). The pump was not the correct diameter for the hole in the bag, and it happened to make a farcical noise with each stroke. After much labour in an oxygen-deprived environment, the bag would be a bit more balloon-like, containing approximately 40 litres of air, which translated to about 120 seconds of breathing time. Once the one-way breathing valve apparatus was attached, that gave me or the other participant barely enough time to step out of the hypoxic chamber with a nosepeg and this big bag attached to our mouths, before tottering across the lab, down a corridor, past bemused workers to the toilets, before returning before the bag emptied of air entirely! 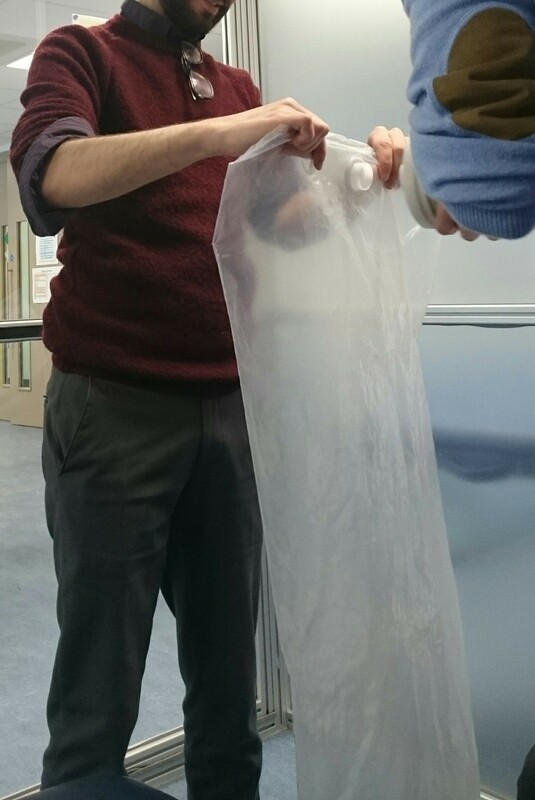 Two researchers prepare the airbag for a trip to the loo! The day ended with a final battery of tests and a second blood sample. I had managed to do a full day’s work in the hypoxic chamber, despite a dull headache from the oxygen deprivation and having to lie on a bed for tests every couple of hours. Throughout the time in the hypoxic chamber, my oxygen saturation was somewhere between 75-85% (it is normally 98+% in a healthy individual at sea level), and my resting heart rate increased by 10-20bpm. Hopefully my day spent in the chamber will help provide useful stats from which the researchers can draw meaningful conclusions, which will help not just visitors to high altitudes but also people back at sea level with critical conditions.